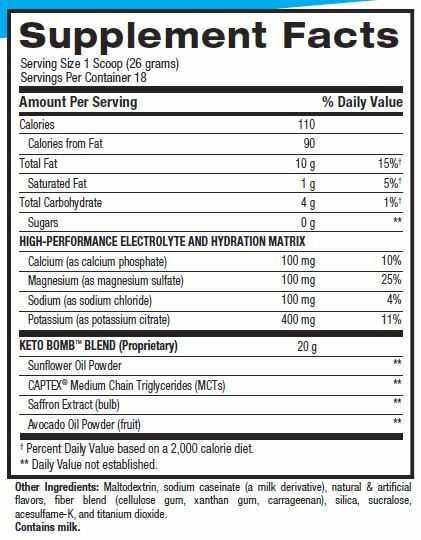 WEIGHT LOSS - Not only does Keto Bomb™ taste amazing, but it helps fuel your ketogenic weight loss goals, by including MCT's (Medium Chain Triglycerides), as well as natural sources of essential fats. RECOVERY - Keto Bomb™ also includes a high-performance blend of electrolytes, which help maintain hydration and mineral levels, a challenge often associated with ketogenic or low-carb diets. ENERGY - Add just one scoop of this tasty, sugar free creamer to your favorite beverage to burn fat for fuel, boost energy and improve performance.